If you prefer your rabbit to stay indoors, you may need an indoor rabbit cage. If you live in a home that has no outdoor area or garden, indoor rabbit cages are obviously very useful. Rabbits are wonderful pets and great companions. However, you must make your house rabbit-proof first so that they can run around the house without any restrictions. Rabbits can be trained to use litter boxes easily. Of course, you cannot always leave them freely in your house all the time. 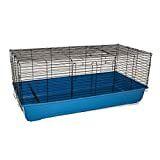 You will need to have a safe place where you can place your rabbit and this is where indoor rabbit cages come in. 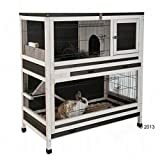 There are a number of choices in the market for indoor rabbit cages. They come in different designs and sizes depending on the kind of rabbit that you have. Indoor rabbit cages can be all wire or they can be made from other materials. Indoor rabbits are usually happy ones because they are often showered with attention from their owner. They are also safer from the dangers in the outside world such as the bad weather and predators. If you want your rabbit to be comfortable inside your house, you have to choose the right cage. Although it is true that bigger is better, space can be a question. Most rabbit owners are worried about the space that the rabbit cage will take up. The ideal size for an indoor rabbit cage is four times the size of the rabbit. If you have more than one rabbit, the cage should be four times bigger than the size of each rabbit that you have. 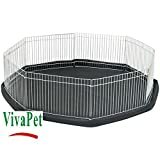 This will allow your pet to move freely inside the cage. Rabbits hop around that is why they need a bigger space. You must also research on the type of rabbit that you have. Know how big it can get. Choose cages that are easy to clean. Cages that have metal-wired floors are very easy to clean but these are not very safe for the rabbit because their nails can get caught. 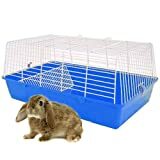 The ideal indoor cage for your rabbit is one that has a solid base. If you want to make it easier to clean, place a newspaper on the floor of the cage and then have a litter box inside. If your rabbit is litter-trained, it will be easier to clean the cage. There are also cages that have splash guards on the sides so that when your rabbits urinate on the edges; your floor will not get dirty. You must also consider the size of your house when you are going to buy a rabbit cage. The cage might occupy too much space that can cramp up your house. If there is not enough space though, you might want to consider placing your rabbit outdoors. When indoors, the best place to place the cage is away from human food. This is also for human safety. You can also choose to have wheels on the cage so that you can easily move it when you are cleaning.